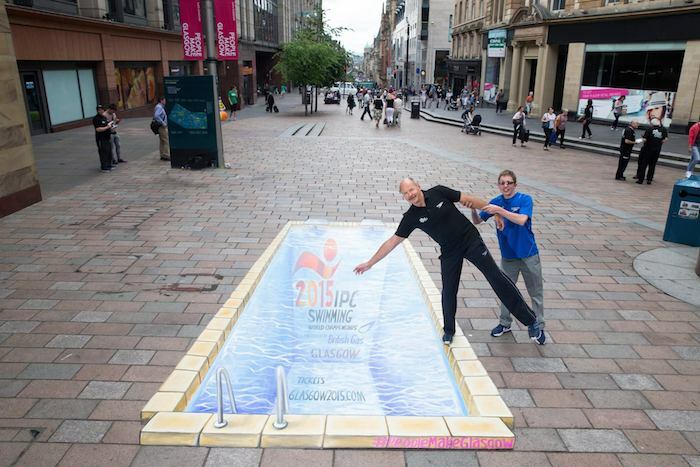 IPC Swimming World Championships take the plunge in Glasgow with some impressive 3D Street Art! 1976 Gold Medallist David Wilkie and GB para-swimmer Scott Quin tested out Glasgow’s newest swimming pool in the city centre! Passersby had the opportunity to take a selfie with our Paralympic themed 3D Street Art to be in with a chance of winning a pair of tickets to the IPC Swimming World Championships! 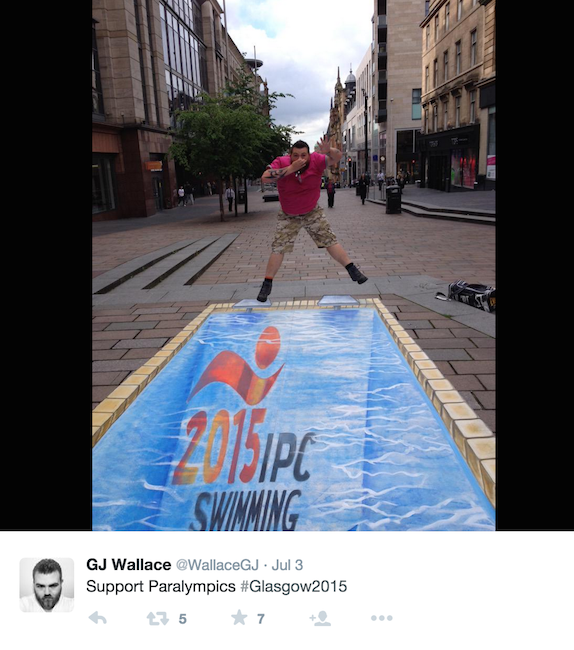 The first 50 passersby to take a selfie with the Paralympic themed 3D Street Art would win a pair of tickets to the IPC Swimming World Championships! Gaining loads of shares on social media and being picked up by local media outlets, 3D Street Art is the perfect way to create a buzz behind your message or event. Our team at Street Advertising Services are all about promoting worthy causes! Check out the recent Clean Advertising campaign we did for Muslim Aid! Or watch live at Glasgow2015.com. 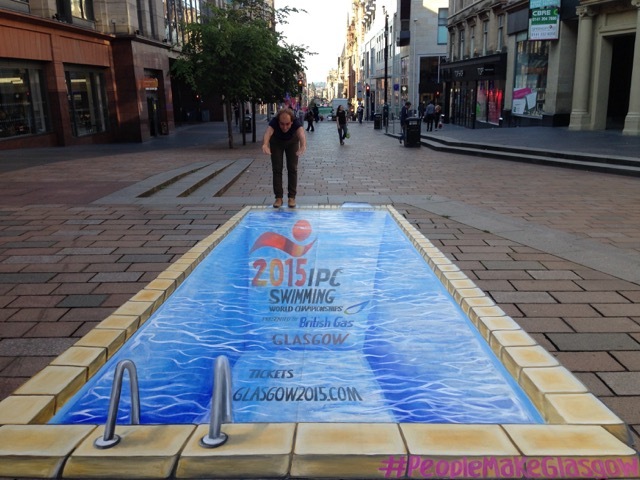 If you would like to make a splash with 3D Street Art for your brand or event then get in touch now! 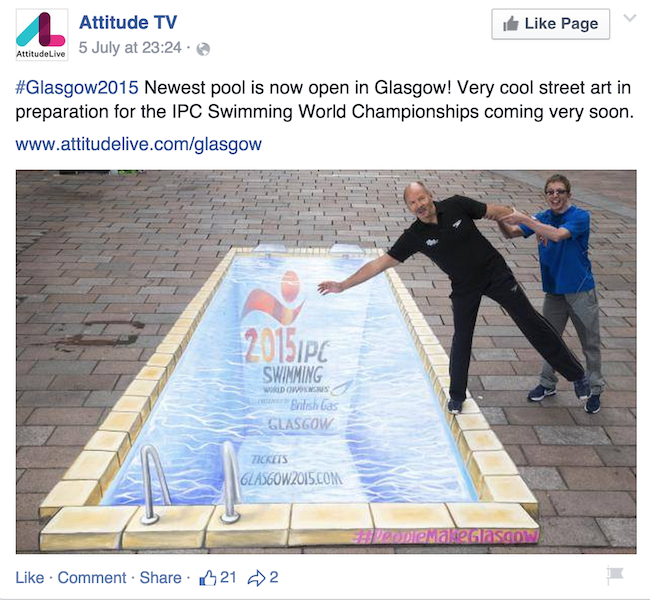 Our team are the UK leading experts on 3D Street Art PR stunts for business!